Properties in Area Naturale Protetta di Interesse Locale Bosco di Sargiano average 4.7 out of 5 stars. Old independent farmhouse with private pool and garden. Between Castiglion Fiorentino and Arezzo. Property 66: Old independent farmhouse with private pool and garden. Between Castiglion Fiorentino and Arezzo. 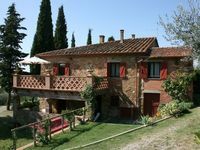 Our stay in the hills outside of Castiglion Fiorentina was the highlight of our vacation in Italy. The accommodations were outstanding and we would love to return. We had a lovely week in this property. The accommodation was excellent with 4 good sized double bedrooms. The kitchen was fairly basic but perfect for our needs with 2 fridges which were very useful. 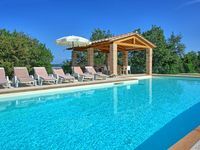 The grounds were stunning with the backdrop of a beautiful olive grove and a stunning swimming pool. The views were very impressive. The owners were delightful and we made good use of their excellent tennis court. We had a great holiday and would love to go back.